Yet another sample from @Wierdo (4/6). I'm regretting opening them all so soon now as I feel they will need finishing off fairly quickly before the air gets to them too much. It's a tough job, eh? I wanted a bottle of this when it was released but missed out so it's great to get a chance to try this one. Reviews are generally pretty good so here goes. Nose - Oh yeah! Creosote, slightly nutty (hazelnut? But definitely some almond) raisins, leather, smoke, toffee and this noticeably dry sweetness that's wrapped around the whole lot. This has got better and better in the coupe of weeks it's been open as well - I can imagine a full bottle really coming on with air time. Taste – Big and peppy. Sweet toffee, fresh ginger and a touch of black pepper with that uniquely Ledaig farmyard (horses stable) peat thing going on. Seemed to have a distinct brandy quality to the taste on first contact that has mellowed and become more of an integrated sweetness. Sweet to dry with a good mouthfeel and easy to sip neat given the abv. Finish - Med-long with lots of smoke, light toffee and hard, black liquorice. Quite dry too. Water opens the nose up nicely and lets the sherry cask start to take a bit more control but it never dominates. More high notes emerge along with a touch more oak, pepper and smoke on the palette. @RianC its interesting that out of the samples I sent you this was my least favourite yet it is possibly your favourite. I like this but was a bit disappointed with it on opening. I think maybe my tastes are changing and I'm going off peated whisky a bit in general. Interesting to see the different takes on this one! 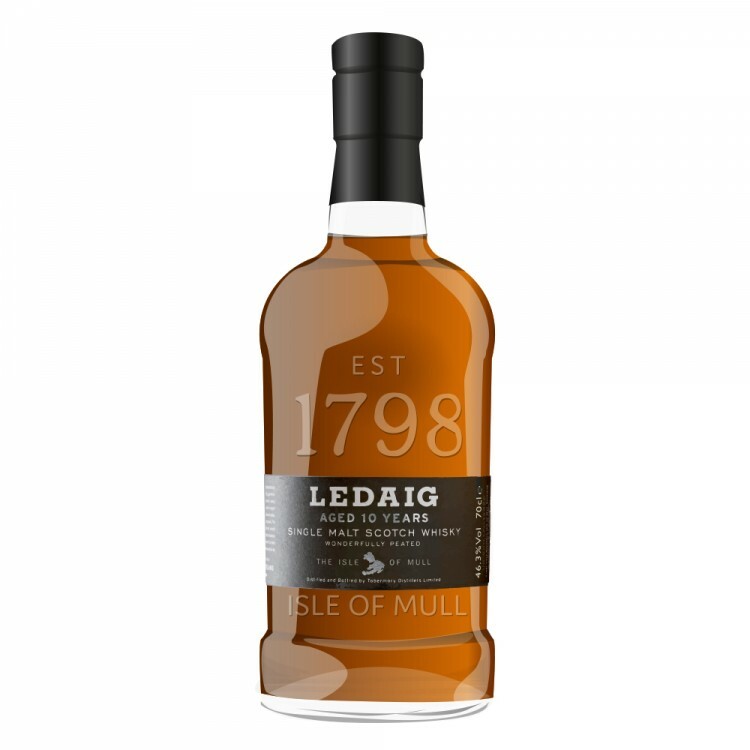 It came out just a while after I first got acquainted with Ledaig, and I remember the buzz about it and that I was a bit sad that it disappeared so quickly into a semi-exorbitant aftermarket. On a side note, I revisited my ol' Ledaig 10 the other day. Impressions now, bah... maybe it didn't take well to time, but it felt very one-trick-pony that day. Wisky with smoke. Not bad, but that's about it. And it was fun to reflect on that, cause it was probably the one that helped me make a move into peat back in. Since, with a more attuned palate, I've found many many other smoky/peated expressions I like so much more... but fear not, dearest Ledaig, you'll always have a special place for introducing me to that universe which I prior had shunned! @Wierdo - I seem to remember you saying you weren't that impressed with it actually. Different tastes indeed! I'm perhaps going the other way in that it's rare I find a non-peaty whisky that I really like. The Linkwood was a very pleasant surprise! The Balblair you sent is an interesting one: I like it and think it's a very good whisky but it just seems to lack a little 'oomph' (technical term;) - not peat necessarily but a certain boldness that I like in a whisky. That said, I can see why some would really appreciate the subtleties, perhaps in ways that I wouldn't. Reminds me a bit of Clyenlish 14 - enjoyable and well-made but a little tame. @RikS - I get the sense that Ledaig is a bit of a 'Marmite malt'. It has that unusual farmy quality to it that I really like but I can see why others would be put off or not find it that enticing. I got another bottle of the 10 before xmas and am curious to see if I enjoy it as much as last time - I noticed the bottle was definitely darker in colour than the last. The Cask of Amontillado is a great story. Sounds like a good whisky too! It sounds like it could be right up my alley, I tried to get a bottle of this when it landed on LCBO shelves but the frenzy that happened din Europe happened there too except on a micro scale. That said the reviews are really love or hate, it seems rather divisive. @RikS I find this happens, based on my mood, tastes, you can re-visit something a whisky and find it much different than when you first appreciated it. Sometimes it's your palate that has evolved other times it's just the tastes of the day that are not in line with it. This is a distillery that I have been hankering to revisit. I initially wasn't a fan but that is solely based on a bar pour of the 10yr. I may spring for a bottle of the 10yr in a couple weeks. @KRB80 - I've tried a few Ledaigs now and the only one that didn't really grab me was the 18 -it just didn't work as well with the sherry casks (PX I think). If you ever get the chance to try an IB, especially from a younger bourbon cask, don't hesitate. @RianC I'm gonna take the plunge with the 10yr first. There is also a 13yr Refill Sherry (113.8 proof), a 16yr Connoisseur's Choice (86 proof), and a 19yr Cadenhead (107.4 prrof) at my local shop. The Cadenhead, in particular, intrigues me. @RianC So, I bought a bottle of the Ledaig 10 today and I absolutely love it! In many ways it parallels Longrow for me....I dunno, maybe it's that dirty, funky, rubbery, machine oil thing that it has going on. Also, it's waxy and the black licorice on the finish is absolutely lovely.This is truly fantastic stuff and and an absolute bargain. That Cadenhead 19yr will have to be my next purchase in a month or so. @KRB80 - Nice one! Glad you're enjoying it and that the quality is keeping up. It was one of those bottles that disappeared quickly!